Are you looking for a DJ set or DJ gear for your party, event, festival or fashion show? On this page, you can find all the DJ gear you can rent. We have DJ CD players, DJ mixers, turntables, DJ monitors and DJ booths for rent. Complete Pioneer DJ sets. From basic DJ set to the world standard for festivals and clubs. Our DJ sets can easily be connected to sound systems. Whenever thousands of potential customers pass your exhibition booth, you will want to stand out. Being an exhibition partner, we’d be happy to help you achieve your goal. On the page below, you can find some examples of exhibition setups, which can easily be adjusted to the dimensions of your exhibition booth. Please contact us for a tailor-made quotation. We offer quick, transparent, and accurate service at low transportation costs, thanks to our perfect location close to the Amsterdam RAI, Jaarbeurs Utrecht, Gorinchem events hall, EXPO Houten, WTC Rotterdam and World Forum The Hague. Lights for your exhibition, fashion show, presentation or other event? Lighting sets with spots, followspot LED spots and more for your stage, catwalk, exhibition booth. Do you need help to choose the right lighting for your event? Contact us and we’d be happy to advise you. Want to rent lighting for your event? Light helps create the ambiance of events and are a fantastic way of decorating a venue. On this page, you can find an overview of our lighting equipment for your party, exhibition, fashion show, performance or conference. Pipe & Drape is an ideal system to make large event venues seem smaller or to add to the atmosphere of the room. The system consists of horizontals, vertical uprights, bases, and backdrops. Pipe & Drape systems are often used for parties, shows, productions, conferences, and weddings. You can rent pipe & drape per running metre. Do you need one section of 20 metres? Then you add 20 meters to your quotation. Do you like to make 4 separate sections of 6 meters wide? Then you enter the number 24. Don’t forget to mention the exact length of the sections you like to make. For seperate there is more material required. Without specific information on your setup, we will tacitly assume that you like to make one large section. Select your projector setup at this page. You can select the projectors based on the amount of lux (the light output of the projector). Moreover we offer several projection screens and other supporting video equipment. Small venue or no place for a projector? Then TV or Vidiwall hire can be a solution. Sound is crucial to all events. Think of a large party, drinks, business, presentation, a product launch or any other event. We will supply you with the perfect sound solution, no matter the occasion. You can rent an audio installation for smaller or bigger events. Are you organising an even larger event? Please contact us for a personal quotation. Our sound systems for events, performances or parties. Select a sound system based on the number of people attending your event. Mixers, DJ mixers or other audio sources can easily be connected to all our sound systems. Special effects help to create a special experience during events. We have various special effects for rent, such as confetti, CO₂, dropfx and smoke. Tell us more about your event and your wishes and we will advise you on the right special effects kit for you. Truss is a modular product and, thanks to our large collection of truss sections, corner pieces and accessories, can be used to create various different constructions. Being the audiovisual partner of many event organisers, we have provided truss for a variety of events, conferences, seminars and exhibitions. If you are looking for a specific construction, or have a particular shape or setup in mind, please let us know. We’d be happy to discuss the possibilities with you. 100-cm aluminium pipe. To be used as outrigger or as truss support. Below, you can find all our video rental products. You can rent a TV set, as well as other items such as a projector, laptop or touchscreen. The advantage of renting a TV is the fact that you always have a clear light output. You can directly plug a USB stick in the television, making everything compact and easy-to-use. When it comes to larger presentations, it will be a good idea to rent a projector. If you want to present your product or company in an interactive way, a touchscreen is the solution for you. Videowalls consist out of multiple TV’s which are mounted to each other to increase the screen surface. The TV’s can be hung or ground stacked. A video wall is often used at large events, product launches and workshops, cause of their brightness and sharp image. Vidiwalls consist out of multiple TV’s which are mounted to each other to increase the screen surface. The TV’s can be hung or ground stacked. A video wall is often used at large events, product launches and workshops, cause of their brightness and sharp image. Choose the size of the vidiwall you need for your event. Small vidiwalls are often used in lobby’s, hotels, as welcome sign in office and for corporate presentations. Larger vidiwalls can be used during openings, festivals and in shoppingmalls. Every vidiwall is based on the same Samsung 46″ TV screens which deliver sharp and bright images. The TV’s can be hung or ground stacked. Powerful LED lighting, without the need to run cables all over the venue. We offer a variety of superb wireless LED lighting for indoor and outdoor events. The wireless LED lights can be used to create ambiance, as architectural lighting, exhibition lighting or to illuminate a walkway. P.A. systems for your presentation or exhibition booth. Select the audio system based on the size of your audience. Easily add extra wireless handheld, lavalier or headset microphones based on how many presenters you have. Presentation larger than 300 people? No problem! Contact us for more information. We provide confetti sets, confetti shooters and confetti cannons. From small office parties, product launches and openings to large stadiums and festivals, we have a confetti solution for every event. To accommodate you as best as we can, we only charge show days, so you will receive two construction days and one deconstruction day for free. We also have a discount on multiple-day hire, which will automatically be calculated when you fill out the date of hire in the shopping basket. You can also view the construction and deconstruction costs in the shopping basket. Would you like to have a tailor-made quotation? Contact us and let us know your wishes and we will try our best to make them come true. With Pipe & Drape, you can make your event venue seem smaller, or you can hide empty spaces from view. Pipe & Drape can also be used to create a delightful atmosphere, such as white Pipe & Drape for weddings or corporate events. The Pipe & Drape system comes in heights between 1.80 and 4.20 metres. All prices are per running metre. Whether you are organising a party, event, product launch, presentation, fashion show or exhibition, a good stage or catwalk is a true necessity. You can combine our products to create a stage or catwalk that fulfils all of your wishes. We also have professional and convenient ready-to-use stage sets and catwalks for you. Choose the stage size you need. Each stage set has a height of 40 cm and comes with stage stairs. The front and sides of the stage come with stage skirts. These stage sets can easily be expanded and customised to your wishes. A Smart TV with TV stand. Perfect for exhibitions, presentations or other events. The TV comes in four different sizes. Every TV is equipped with a power cable and HDMI cable. You can easily connect a USB stick to the TV to play movies or images in a loop. You can find the various designs for a truss construction below. All designs can be adjusted in size and shape. Are you looking for a different truss design? Contact us for a tailor-made quotation. A TV is a fantastic way to show your company presentation or video on at your exhibition booth. We offer screens up to 75” (191 cm in diagonal), and even larger screens as videowalls. CO₂ jets and guns will add a spectacular effect to your event, show, opening or performance. The CO₂ Present Launcher can be used to shoot gadgets into the audience. You will need a CO₂ cylinder for all our CO₂ effects. We also provide complete catwalk sets. Each catwalk has a height of 40 cm and comes with stage skirts to prevent your audience from looking under the stage. Every catwalk set is customisable. The DJ Booth is the desk on which the DJ equipment is placed during the event. We offer basic DJ booths, as well as DJ booths with integrated LED lighting. Create the perfect ambiance for your party with these disco party lights. These disco lights will light up the dance floor, adding colour to your event. These light effects are great in combination with a lightset. From strobe to UV light and from moving head to laser, for all sort of event we have a great lighting solution. Easily add exhibition booth EXPO lighting to your order. Powerful floodlights and colourful LED spots, all you need for your event. The perfect way to colour a building, exhibition booth, garden, entrance or other large surface. The floodlights spread an evenly wide bundle of light over a large surface. The Pipe & Drape FOH kit is used to cover all the cables and wires that run around the FOH control area. The system is flexible and can therefore easily be adjusted to the size of your FOH setup. A presentation system is used for speeches or background music. Select the ideal system based on the size of the expected audience. These sets are perfect for events, conferences and exhibitions, and come with a wireless microphone and mixer you can connect other audio sources to. Choose the right size projection screen. All our projection screens are 16:9 and therewith suitable for HD presentations. Our projection screens are ranging from 120″ (305 cm) till 220″ (558m) in diagonal. Create your own truss setup by manually selecting the truss parts you need. All our truss comes from the Prolyte H30V Series. This is a world-renowned truss brand known for its reliability and strength. Please make sure to have your personal truss construction checked by a professional. Touchscreen with stand. Perfect for exhibitions, interactive presentations and seminars. As part of being a one-stop exhibition shop, we also provide signage for your exhibition booth. You can either choose single or double-sided PVC banners. Select the amount of square metres in order to calculate the price. Please note that there is a 12-working day production time on all banners. Our battery-powered speakers enable you to play music for an average of 4 to 7 hours, depending on the level of usage. A battery-powered speaker can be used for groups up to 50 people. Pioneer DJ and Allen & Heath DJ mixers. From basic 2-channel DJ mixer to the world-renowned Pioneer DJM-900 NXS mixers. Followspot to light people or objects from far. This 50 watt LED bundle is ideal for performances or to lit art objects. A lectern is an aid for the presenter or speaker at your event. The lectern has space for papers, cheat sheets, a tablet and a gooseneck microphone. Select a complete party light set for your event or party. Perfect for groups up to 150 people. Are you expecting more people or do you need advice? Please don’t hesitate to contact us. You can use Pipe & Drape systems as room divider or decoration at event venues. Many AV professionals use these systems. It works quickly and will result in a chic event venue in this short time. Sometimes AV professionals haven’t enough stock to complete the configuration. Therefore, it is also possible to rent the parts without massive costs. The more powerful the projector’s lamp, the higher the light output (lux). A higher lux gives you a better performance on the projection screen. We recommend the 3000 lux projectors for small projection screens and smaller venues. When it comes to larger venues or projection screens, a 7000 or 12.000 lux projector will be a better fit. Do you need advice selecting the right projector? Contact us! We’d be happy to help. Smoke and haze help you to enhance your laser or light show. The sound desk is the heart of your sound system. All incoming audio runs through it, before being distributed to the speakers. For small presentations or performances with a microphone and CD player, a small 10 channel mixer will be sufficient. Digital sound desks are more suited for the experienced audio technicians operating bands, conferences, business presentations and other performances using multiple audio sources. Expand your stage or catwalk with these stage decks. All these parts are from the Prolyte StageDex Basicline Series and can easily be combined with each other. If you need any advice, please get in touch with us. We’d be happy to help! Our DJ media players can play music from a USB stick . We recommend the Pioneer XDJ-700 for beginning DJs or smaller parties. The Pioneer CDJ-2000 NXS DJ Media Player has the most functionalities and is the world standard for DJ players. You will find the Pioneer CDJ-2000 NXS at every big festival and in every club. For the vinyl lovers, we have the Technics decks in our rental stock. EXPO lighting is the perfect option for illuminating an exhibition booth, building or other large objects. The floodlight spots will equally light every large surface. These are also often used for openings, ceremonies and promotional activities at offices, restaurants, hotels and other venues. All stage legs come from the Prolyte StageDex Series and can be combined with the stage decks above. The stage legs are made of lightweight aluminium and are available in different heights, from 20 cm up to 100 cm. Each stage deck requires four stage legs. Prolyte H30V truss baseplates can be placed under the upright truss columns. Choose the size of the videowall you need for your event. Small videowalls are often used in lobbies, hotels, as a welcome sign in offices or for corporate presentations. Larger videowalls can be used during openings, festivals and in shopping centres. Every videowall is based on the same Samsung 46” TV screens which provide sharp and bright images. The TVs can either be hung or stacked on the ground. This powerful wind fans are used for performances and events, either to distribute the haze over the stage or as extra support for confetti shooters. A wireless microphone can easily be connected to an audio mixer or sound system. You can choose between wireless hand microphones, lavalier microphones and headset microphones. The characteristics of a microphone differ from type to type. Therefore, it’s important to choose the right microphone for the job. We can provide you with the perfect microphone for every occasion. Let us know if you need help selecting the right microphone. Single tubes can be used as an outrigger or to give your truss construction more strength. Make sure your stage and everybody on it are well-lit. 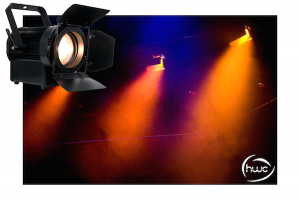 You can choose from stage lighting as wash spots (Fresnel), profile spots or a follow spot. Stage stairs help you make a good entrance and make it easier to climb the stage or catwalk. Create the perfect stage stairs by combining stage steps of different heights. Each step is 100 cm wide and can easily be attached to other steps. At larger events, you will often encounter one or two speakers positioned next to or above the DJ. These speakers ensure that the DJ doesn’t have any delays when mixing tracks. We recommend renting a DJ monitor for events over 250 people. Show laptops to be used for presentations and check-in counters. We have a large variety of microphone stands, either with or without boom. A microphone stand with boom is often used at concerts and presentations. Singers, comedians and presenters that like to stand close to the microphone will likely choose for the stand with base. All the supporting technology for your presentation. Countdown clock or presentation clicker. Make sure your audience doesn’t look under the stage. Use stage drape to block their view. Stage skirts are available for every type of stage and catwalk and are rented per running metre. DI boxes can be used for connecting your laptop or guitar to the sound desk. We rent out various DJ accessories which can be connected to the DJ equipment. A microphone for the DJ or MC, or a UTP hub to connect Pioneer DJ players with each other. Ladder truss can be used for small events and exhibition booths. Truss lifts (wind up stands) and manual hoists to elevate complete truss constructions. Stage carpet gives your stage or catwalk a clean and elegant look. The carpet tiles measure 50 x 50 cm and are rented per square metre. If you want to rent stage carpet in a colour other than black, blue or red please get in touch with us. Backdrop to create a descent background of a stage or event venue. Easy connectable to truss. A lectern is often used during openings, ceremonies and speeches. The white glossy paint ensures that the lectern fits nicely on every stage. You can also rent video accessories such as cables, adapters, splitters and extension cables. We offer high-quality Black Magic video equipment, Roland video mixers and more. Kabuki Drop Systems are the perfect tool for revealing a product or building and are therefore perfect for openings and products launches. All the rigging accessories you need during a truss or rigging setup. 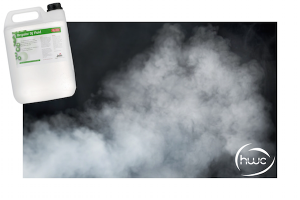 Powerful smoke machines or hazer of the renowned brand Look Solutions. Fill the venue with a thick or thin layer of smoke. The smoke will enhance the effects of any lasers or beams of light. Essential by organising the lighting for your event are items as a light stand or emergency lighting.